Sometimes the CFL package makes it easy by providing information in a conspicuous place on the packaging. For instance, it may say something to the effect of “This bulb replaces a 60 watt incandescent bulb.” In the case of a 60 watt incandescent bulb, a CFL will produce the same amount of light while only using 13 watts of energy. Keeping on that train of thought, a 100 watt incandescent bulb will be replaced by a CFL using 23-25 watts of energy. If you have any doubts, take a look at the lumens of each bulb, they should be comparable. 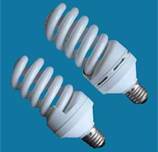 The initial price of a CFL may be a little bit shocking when compared to the low cost of an incandescent bulb. Keep in mind that the CFL will most likely last much longer saving you money on the bulb in the long run. Also keep in mind that the CFL will save you money in energy costs every month. The CFL looks more costly initially but will actually end up saving money over time.